Blessing of Might: Back to RET and it feels soooo good. Well I respecced back to Ret over the weekend and immediately felt "home" if that's the right word for it. Things were back to the way I knew them. 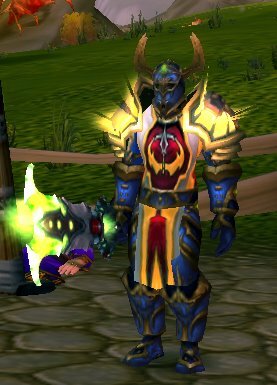 BUT... with patch 3.1 aka Dual-Spec hitting the PTR tonight (or so people say) I still need to build up my holy gear for my off-set. With that in mind I started doing heroics for badge gear. I did about 4 different heroics and got a spiffy set of PvE legs from Violet Hold. It was actually my first time ever running not just heroics but 5 mans of any kind for the most part. I find I'm able to easily keep up with most groups DPS, although in a very geared PvE group I'm anywhere from 100-300 dps under the group average. In a typical PUG I keep up the average. Anywhere from 1600-2000 depending on the buffs and type of fight. I was concerned about keeping up since I had never run these dungeons, fortunately a guy named Cityhunder0505 had some excellent video guides that gave me a good idea of what to expect when doing the instances. I'd highly recommend checking out his video guides for any instances you need help with. Lastly, I've upped my badge count from 8 emblems of heroism to 31. Leaving me 4 short of my protective barricade of the light I'm going for on the holy set.